In an earlier thought experiment 1 for this site, I examined the history of multiple-member and statewide at-large districts in congressional elections, and wondered whether a movement away from the near-universal use of single-member districts (SMDs) in American legislative elections might be advisable and politically feasible. Electoral systems that feature SMDs with plurality rule -- like the United States and Great Britain -- tend to gravitate into two-party duopolies, a situation that frustrates third-party supporters and self-identified independents. Despite being paralyzed by polarized politics 2, policy gridlock 3 and low approval ratings 4, the furthest thing from the minds of members of Congress is a reform campaign to alter an electoral system that, by definition, has made them winners already. District magnitude is only part of the equation, however. Given pervasive gerrymandering and a shrinking number of competitive districts, any serious reform of congressional elections might also entail changes to our voting rules -- that is, how votes are cast by voters and aggregated to determine winners. Voting rules reform wouldn't automatically guarantee better candidates, more electoral competition, higher voter turnout, lower citizen apathy or a more responsive and responsible Congress. But it almost certainly couldn't make matters worse. Starting with turnout incentives, voters in single-member, plurality rule U.S. House districts that are also highly gerrymandered often have little incentive to turn out. A perceived lack of electoral importance may be a strong deterrent to registered Republicans in heavily Democratic districts (or vice versa), non-white voters in overwhelmingly white districts, female voters facing a ballot on which all nominees are men, or third-party or independent voters in nearly every House district. There may be other elective offices -- like the presidential race -- or ballot measures that induce a voter to show up on Election Day, of course; but if the results in these contests also seem pre-ordained, there is little reason to vote. Other countries employ a variety of alternative voting rules, including at-large, multiple-member districts with plurality voting, majority-rule runoffs in single-member districts, instant runoff voting, approval voting, proportional representation, and transferable vote systems, among others. A few exceptions aside, however, the United States features the near-universal use of SMDs with plurality rule. Voting rule experts and electoral reform advocates believe alternative systems would encourage higher voter participation rates and create more competitive elections. Given America's comparatively low 7 turnout rates 8, it's hard to imagine participation rates falling much further. The critique of single-member, plurality-rule systems is that they both discourage and preclude the expression of secondary preferences, thereby reducing participation rates and reinforcing the power of the two dominant parties. Independent or alternative gerrymandering procedures, argues Rob Richie of the electoral non-profit FairVote.org, might help but alone are insufficient. “Any assumption that nationwide independent redistricting commissions would do away with partisan bias would only hold true if a commission's only priority was fair partisan representation,” Richie wrote 9 recently in Salon. FairVote advocates the use of multiple-member districts 10 and some form of instant run-off voting (IRV) -- in which voters can indicate preferences of not just their favorite candidate but also secondary (and so on) preferences -- in the belief that it would produce winners more aligned with voters' actual ideological-partisan attachments. The good news is that there is a limited history 11 of using IRV by some American states; the bad news is that its use is, well, rather limited. As for the second effect -- the strategic voting implications of alternative voting rules -- there's no doubt that if alternative voting rules were adopted, American voters would need to think differently at the polls. Consider the simplified scenario below featuring nine voters (R through Z) and eight candidates (Adams through Harrison), and the outcomes under five distinct voting rules: (1) single-member district plurality rule; (2) two-member district with plurality rule; (3) majority rule run-off; (4) approval voting; and (5) Borda count. 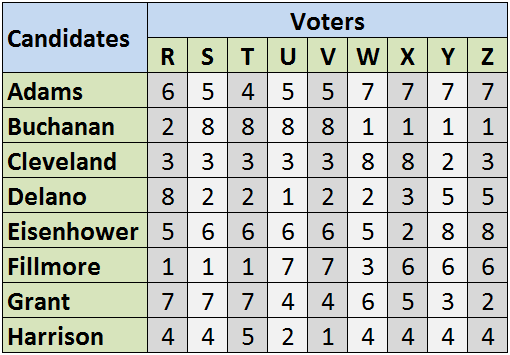 For each voter, their preferences for the candidates are ranked, highest to lowest, from 1 to 8, as shown in Chart 1. Thomas F. Schaller is a professor of political science at the University of Maryland, Baltimore County. He is the author of Whistling Past Dixie: How Democrats Can Win Without the South 12 and national political columnist for the Baltimore Sun.